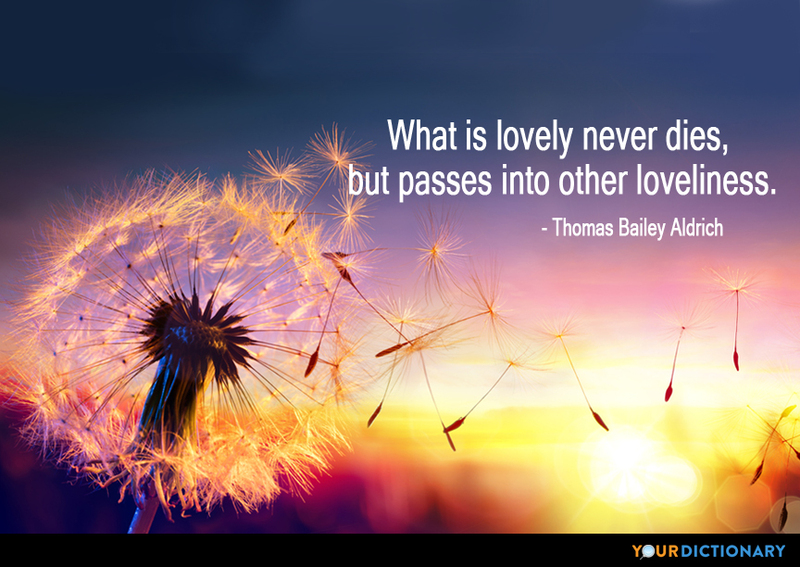 Thomas Bailey Aldrich (November 11, 1836 – March 19, 1907) was a poet and novelist born in Portsmouth, USA. Night is a stealthy, evil raven, wrapt to the eyes in his black wings.  Thomas Bailey Aldrich, Day and Night. So precious life is! Even to the old The hours are as a miser’s coins!  Broken Music; reported in Bartlett's Familiar Quotations, 10th ed. (1919). I like not lady-slippers, Nor yet the sweet-pea blossoms, Nor yet the flaky roses, Red or white as snow; I like the chaliced lilies, The heavy Eastern lilies, The gorgeous tiger-lilies, That in our garden grow.  Tiger Lilies, Stanza 1.  Leaves From a Notebook, Ponkapog Papers (1903). When friends are at your hearthside met, Sweet courtesy has done its most. If you have made each guest forget That he himself is not the host.  Hospitality; reported in Hoyt's New Cyclopedia Of Practical Quotations (1922), p. 379. Here is woe, a self and not the mask of woe.  Andromeda; reported in Bartlett's Familiar Quotations, 10th ed. (1919). That was indeed to live—At one bold swoop to wrestFrom darkling death the bestThat Death to Life can give!  Shaw. Memorial Ode; reported in Bartlett's Familiar Quotations, 10th ed. (1919). Good night! I have to say good night, To such a host of peerless things!  Thomas Bailey Aldrich, Palabras Carinosas. In her eyes a thought Grew sweeter and sweeter, deepening like the dawn, A mystical forewarning.  Thomas Bailey Aldrich, Pythagoras. We weep when we are born, Not when we die!  Thomas Bailey Aldrich, Metempsychosis. Phrase found in Les Paroles Remarquables, les Bon Mots et les Maximes Orientaux, Ed. by Galland (1694). Or light or dark, or short or tall, She sets a springe to snare them all: All's one to her above her fan She'd make sweet eyes at Caliban.  Thomas Bailey Aldrich, Quatrains, Coquette. The happy bells shall ring Marguerite; The summer birds shall sing Marguerite; You smile but you shall wear Orange blossoms in your hair, Marguerite. When friends are at your hearthside met, Sweet courtesy has done its most If you have made each guest forget That he himself is not the host.  Thomas Bailey Aldrich, Hospitality. When I behold what pleasure is Pursuit, What life, what glorious eagerness it is, Then mark how full Possession falls from this, How fairer seems the blossom than the fruit, I am perplext, and often stricken mute, Wondering which attained the higher bliss, The wing'd insect, or the chrysalis It thrust aside with unreluctant foot.  Thomas Bailey Aldrich, Sonnet, Pursuit and Possession. Hebe's here, May is here! The air is fresh and sunny; And the miser-bees are busy Hoarding golden honey. October turned my maple's leaves to gold; the most are gone now. Here and there one lingers, soon these will slip from out the twig's weak hold, like coins between a dying miser's fingers.  Thomas Bailey Aldrich, Maple Leaves. Day is a snow-white Dove of heaven That from the East glad message brings. Night is a stealthy, evil Raven, Wrapped to the eyes in his black wings. These Winter nights against my window-pane, nature with busy pencil draws designs of ferns and blossoms and fine spray of pines, oak-leaf and acorn and fantastic vines, which she will make when summer comes again. Quaint arabesques in argent, flat and cold, like curious Chinese etchings.  Thomas Bailey Aldrich, Frost-Work. We knew it would rain, for the poplars showed The white of their leaves, the amber grain Shrunk in the wind, and the lightning now Is tangled in tremulous skeins of rain.  Thomas Bailey Aldrich, Leaves From a Notebook, Ponkapog Papers (1903). Upon the cunning loom of thought We weave our fancies, so and so.  Thomas Bailey Aldrich, Cloth of Gold, Prelude; Reported in Hoyt's New Cyclopedia Of Practical Quotations (1922), p. 787-90.